BROADWAY VINYL ALERT: Jesus Christ Superstar Live & The Secret Garden Double LP Available Exclusively At Barnes & Noble! 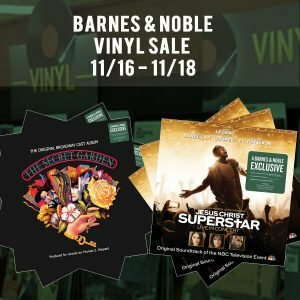 It’s Vinyl Weekend at Barnes and Noble on 11/16-11/18 and we’re thrilled to announce that Jesus Christ Superstar LIVE (click here) and The Secret Garden (click here) are available on vinyl exclusively at Barnes & Noble! They have dozens of new exclusives, plus get 10% off hundreds of vinyl albums at all B&N stores and BN.com. Click here for all titles.